"Love" seems to me something which is impossible to define, to grasp. Centuries of authors, of philosophers, have tried to do so in vain. There is always something left to be said. As in death, love is a topic of infinite discourse. As Tolstoy echoes in the mouth of Anna Karenina's titular heroine: "'I think... if there are as many minds as there are men, then there are as many kinds of love as there are hearts.'" Love is infinite in it's permutations, and therefore cannot be defined. What Barthes offers is not a definition of Love, but what it is to be a Lover. Barthes, like his predecessors Proust, Shakespeare, Ovid, Baudelaire, Goethe, Stendhal, etc., is a troubadour of the pains of jealousy disguised as the joys of love. A Lover's Discourse is a masterful fugue of personal experience, literary precedence, and theoretical musing, which evokes emotion in the same pitch as a novel, but elicits introspection with the intellectual skepticism of Hamlet. As a piece representative of the Barthesian oeuvre, A Lover's Discourse straddles the duality of speech and meaning, of what it means to be a lover, but also the very discourse of love. The book itself is divided pell-mell into short fragments related to the amorous phraseology: "s'abîmer...," "cœur," "casés..." etc. 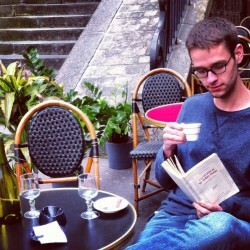 It is the layered language of love which interests Barthes: what do we say when we are in love? - is what we intend what we say? - what does what we say really mean, what does it signify? Though the semiotic approach to love seems distant and cold, it is the inverse which we feel when reading Barthes, whose very language moves the reader to a shudder of feeling: Am I in love? --yes, since I am waiting. The other one never waits. Sometimes I want to play the part of the one who doesn't wait; I try to busy myself elsewhere, to arrive late; but I always lose at this game. Whatever I do, I find myself there, with nothing to do, punctual, even ahead of time. The lover's fatal identity is precisely this: I am the one who waits.Perhaps this book, novelistic essay or essayistic novel, must be read in one's prime, when one is in the throes of passion, to feel the full emotional impact - I do not know if this is the case. As a young man I am always on the precipice of romantic disaster, only in utter solitude, removed from all passionate enterprises, do I feel free from the pharmacopoeia (half-poison, half-remedy) of love. Bliss and misery are the Janus faces of life, in love, in solitude, we cannot have one without the other, even if they only look at us in turns.The world subjects every enterprise to an alternative; that of success or failure, of victory or defeat... Flouted in my enterprise (as it happens), I emerge from it neither victor nor vanquished: I am tragic.Love, life, and death, are infinite, they are the lands of contradictions, beyond the capacity of language. What is both bliss and misery? What is the concatenation of victory and failure? How does die and yet endure? At these interstices of language lies the fundamental truths of Love. What does it mean to be in love? It is a notion idealized and raised on high by all men, it is the apparent culmination of our lives. But with Love comes pain. For Barthes Love is inseparable from Jealousy: if we are not jealous, it diminishes our love, it negates it. We can never be happy in love, never truly happy, never complaisant. The lover is always waiting, he must ever have his love validated, requited, and won. Every win in love is a Pyrrhic victory, every favor won is hours, days, of agony paid for. This is the view which Barthes takes, but it is not his argument. His view of love is a flavor of A Lover's Discourse, but it is not the entire course. What do we mean when we declare the object of our love "adorable"? What do we mean when we affirm our love? These are the concerns of Barthes. "What do we mean when we are in love?" no "what do we mean when we say 'I am in love'?" The question of A Lover's Discourse is not "how does one define love?" but rather, more fundamentally, how does one even begin to discuss it? When we read the Romantics, Byron, Keats, Shelley, we are presented with a view of Love that seems too large, too incompatible with feeble man: something more withheld from man for his imperfections, something which is manifest as a remote deity. Contrarily, when we discuss it in the quotidian tongue, it seems to us too pale a light: it lacks the allure of passion, something is missing. 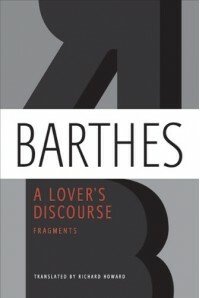 Despite his apotheosis of Language, even Barthes feels its inadequacy in front of the edifice of Love: To try to write love is to confront the muck of language; that region of hysteria where language is both too much and too little, excessive (by the limitless expansion of the ego, by emotive submersion) and impoverished (by the codes on which love diminishes and levels it).In front of Love, language is reduced to muck, it is inadequate. Barthes is torn between the deities of Eros and Logos - Love and Language. As a humbled votary genuflecting to the altar of Language, he is prostrate before the temple of Love.